Paired Down, Vol. 's I & II is dedicated with love and appreciation to my father, the most positive man I know. "In my liner notes to Paired Down, Vol. I, I recounted an incident which had taken place a few days before the recording of theSE duo sessions, at a small New York club where I had just finished a performance with violinist Billy Bang’s quartet. The audience had just been treated to a particularly inspired version of "Bang Music" - Billy's last solo had been a beautiful blending of tradition, personal experience, and the "cutting edge", all characteristically rendered with an almost painful honesty and sincerity. Moments later, a "prominent conservative New York-based jazz writer" walked in with the words "Hey, Billy, still playing out of tune? ", and this remark really got me thinking about the confused set of ideals that often seems to prevail in jazz today; where the focus on individuality of voice, originality of conception, and diversity of influence is often lost in the pursuit of technical execution, adherence to narrow jazz definitions and an overly imitative approach to improvising and composing. Anthony Davis said back in 1982 when this more conservative jazz movement first began to emerge, that "…the truest homage to Charlie Parker, for example, isn't to play his tunes or play just like him, but to...play something new that wouldn't be possible without Charlie Parker's example. The most vital contribution you can make to furthering the jazz tradition is to create your own music, create a new music." The artists on Paired Down were chosen precisely because of this original voice and outlook, balanced by an awareness of jazz's past. I also sought with these recordings to examine some of the more introspective sides of my nature, both through an exploration of the inherently more "pared down" and intimate texture of duo, and through an emphasis, particularly with Volume II, on the more melodic side of my writing. Finally, these sessions came out of the simple desire to interact with those musicians who have played an important role in my development as an artist, players who have constantly challenged me through their work to pursue my own, readily-identifiable "Bang Music." I first met trombonist Ray Anderson at a small Canadian jazz festival while we were both touring with our respective groups, but I had been an admirer of his work for some time. The thing that always struck me about his playing is his incredibly focused, "at-the-moment" energy; so much so that he literally shifts his body from one foot to the other as he waits on the bandstand to play, as if to conjure up as much spontaneity as is humanly possible. I enjoyed our musical dialogue so much during the Paired Down sessions that I’ve included three selections, each of which addresses a different facet of his playing and my conceptual approach: my compositions "Catch It" and "Closing Melody," plus an impromptu musical dialogue entitled "Interlude." Although a respected leader and composer in his own right with several albums to his credit, I came to know bassist Santi Debriano initially for the work he did as sideman in Don Pullen’s trio, back in 1990. 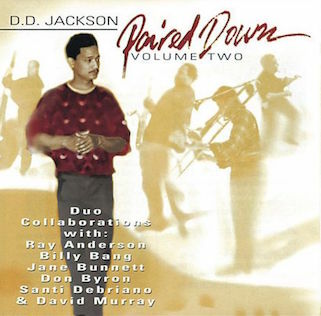 This connection later became bittersweet when we were both called upon by David Murray to participate in the 1996 recording Long Goodbye: A Tribute to Don Pullen for DIW, following my former teacher’s untimely death due from cancer. Since then, Santi has appeared on Paired Down, Vol. I and has also become a regular member of my trio. On Vol. II, I chose my composition "One of the Sweetest" (dedicated to a dear friend and longtime supporter of my music) to highlight Santi’s wonderfully full and lyrical and at the same time technically facile bass playing. Canada’s Jane Bunnett has established a solid reputation for both her spirited and adventurous jazz albums and her many performances and recordings with some of Cuba and Brazil’s greatest musicians. My first exposure to her was through our mutual connection to Don Pullen with whom she had recorded on several occasions - at an Ottawa jam session in the summer of ’91, she overheard me perform a tune of Don’s entitled "Gratitude". She quickly proceeded to introduced herself, and I was soon embarking on my first Canadian tour, as a member of her quintet (which also featured tenor sax great Dewey Redman), and, subsequently, on trips to Europe. Jane is often cited for her adventurous and highly individual soprano sax playing. On Paired Down, Vol. II, though, I thought it might be interesting to address Jane’s often overlooked flute work with a piece I wrote especially for her entitled "Flute-Song." I met Billy Bang and David Murray at the same time, when we were both members of one of producer/conceptionalist Kip Hanrahan’s notorious all-star groups on a European tour in the summer of 1992 (as is typical of Kip’s projects, the band was an eclectic mix of such artists as the rock group Cream’s Jack Bruce, singer Jimmy Scott on his first visit to Europe, drummer J.T. Lewis, Latin percussionists, etc., all of it centered around the writings of the African-American poet Ishmael Reed). In the months following my return I would always make a point of seeing Billy perform whenever he came to town and of re-introducing myself to him. Finally, over a year later after his performance with the Sun Ra Arkestra in New York, I again approached Billy and he immediately asked me: "How would you like to go to Europe?" and so I was off to Europe as a member of the Billy Bang Quartet..."